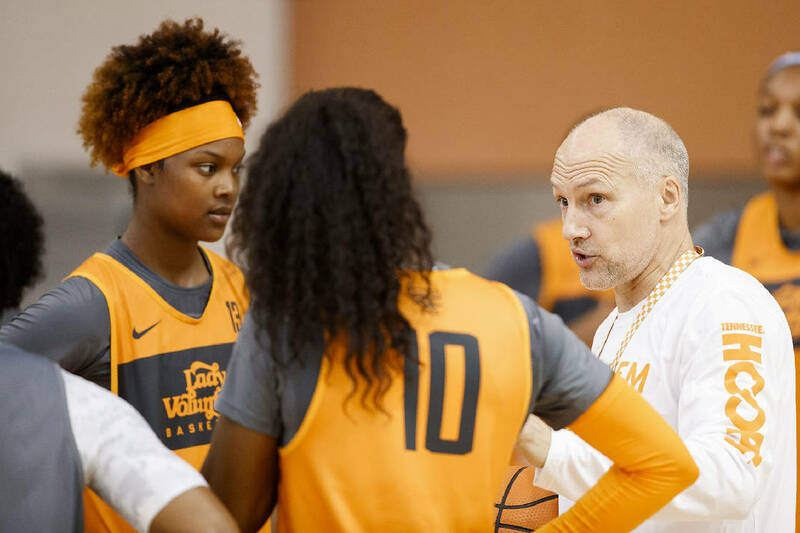 Tennessee women's basketball assistant coach Dean Lockwood talks with Jazmine Massengill of Chattanooga, left, and Meme Jackson (10) during a Lady Vols practice. KNOXVILLE — They have come from Calhoun, Cleveland, Decatur, Ducktown, Etowah and Winchester. The storied history of University of Tennessee women's basketball features a line of players from towns in the southeastern corner of the state. With one notable exception, until now — Chattanooga. Jazmine Massengill will become the first Chattanoogan to wear a Lady Volunteers basketball uniform when Tennessee hosts Carson-Newman in an exhibition game Monday night at 7. "It's definitely an honor," Massengill said. And it's a dream come true for a player who grew up idolizing former Lady Vols and WNBA great Candace Parker. "My daughter has wanted to be a Lady Vol since she was 3," said Jazmine's mother, Charmaine Massengill. "So when I got the picture of her banner hanging in the gym, I cried, because the dream is a reality for her. She's living her dream. It feels good to see it manifest for her." Charmaine once shared a similar ambition. She was going to play college basketball at McNeese State before blowing out her knee as a senior at Pickering High School in rural Louisiana, where she was the first-ever black homecoming queen. Destined for a redshirt season and with family duties beckoning, Charmaine chose to stay home. She never enrolled at McNeese State. After Charmaine settled in Chattanooga years ago, her children picked up where their mother left off. Corwin "C.J." Massengill spent the 2017-18 season as a walk-on guard for the University of Tennessee at Chattanooga men's team, while Jazmine played her senior season at Hamilton Heights Christian Academy. Jazmine finished her high school career as the 25th-best player in the country, according to ESPN's rankings of the 2018 recruiting class. The 6-foot freshman is expected to play right away as Tennessee's backup point guard behind sophomore Evina Westbrook. Tennessee's regular season begins next Sunday when it hosts Presbyterian. The No. 11 Lady Vols are coming off a 25-8 season that ended in the second round of the NCAA tournament. Of 10 healthy players on the roster, seven are freshmen or sophomores, including the 18-year-old Massengill. "Very confident that she can come in, and she and Evina can split time," Tennessee coach Holly Warlick said. "She's got a calming effect to her, which we need. She knows when to slow the ball down; she knows when to pick it up. I knew what I was getting when I sat down and talked with her and watched film. She's a special kid." That Jazmine is able to play for the Lady Vols is no coincidence. She and C.J. practically grew up at the gym, it seemed. Playing AAU basketball over the summers and enrolling at a renowned basketball powerhouse like Hamilton Heights ensured Jazmine received an opportunity she hopes will open doors for other girls in Chattanooga. "I hope so, because there's definitely talented kids in Chattanooga," Jazmine said. "Not everybody can get seen, but they just have to put themselves in a position to get seen. So I definitely encourage them to play AAU or travel ball and get out of Chattanooga." Warlick said Jazmine's energy and natural leadership qualities attracted Tennessee during the recruiting process. Warlick also praised Charmaine and Hamilton Heights coach Keisha Hunt for their impacts on Jazmine's development. "You see a lot of what Jazmine is doing through her mom, because her mom is no-nonsense," Warlick said. "But she's extremely likable. I see so much of her in her mom. It's amazing. Jazmine is very respectful, and they have a great relationship." Tennessee freshman guard Jazmine Massengill, a Chattanooga native, joins the Lady Vols after a standout prep career at Hamilton Heights. Because Parker's No. 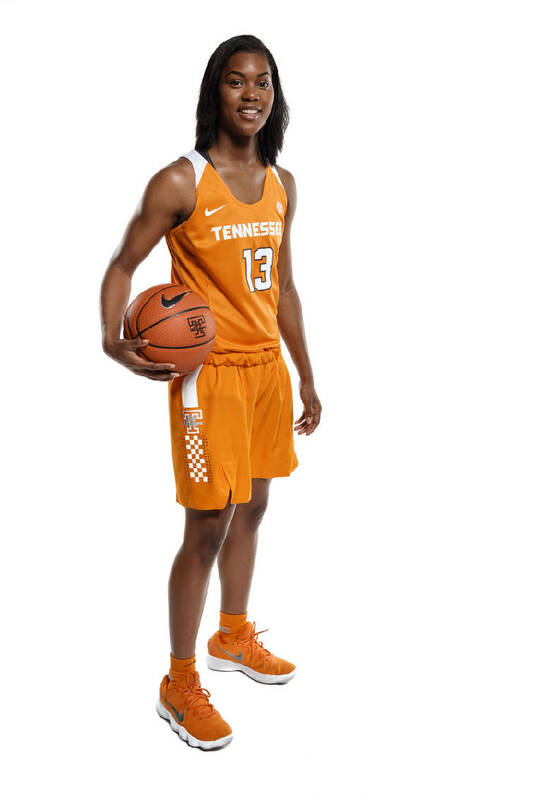 3 jersey is retired at Tennessee, Jazmine is wearing 13. "She had to have a 3 in there," Charmaine said. Seeing Jazmine wearing a Tennessee uniform explains part of Charmaine's pride in her daughter's accomplishments. But she gets just as excited watching her sign autographs for young fans. "Because I told her that this dream she has is bigger than her," Charmaine said, "and now she gets it." She is a Tennessee women's basketball pioneer, representing the state's fourth-largest city on one of the sport's biggest stages. "I think when you're close by, you understand the dynamics of this program," Warlick said. "You understand what it means to people. She came up here a lot before she committed and left here with the sense of, 'Why would I want to play anywhere else?' I think she understands what this program means to this state, to this area, across the country. "And I think she loves the chance to be a part of it." Contact David Cobb at dcobb@timesfreepress.com. Follow him on Twitter @DavidWCobb and on Facebook at facebook.com/volsupdate.